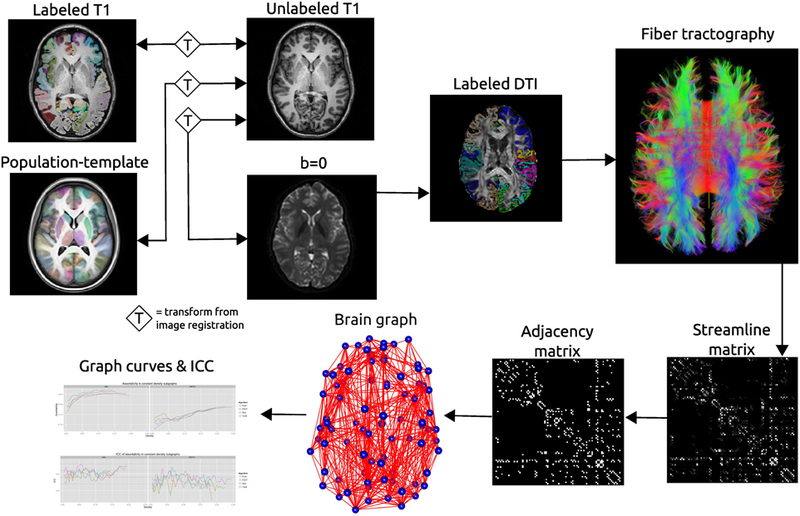 Recent interest in human brain connectivity has led to the application of graph theoretical analysis to human brain structural networks, in particular white matter connectivity inferred from diffusion imaging and fiber tractography. While these methods have been used to study a variety of patient populations, there has been less examination of the reproducibility of these methods. A number of tractography algorithms exist and many of these are known to be sensitive to user-selected parameters. The methods used to derive a connectivity matrix from fiber tractography output may also influence the resulting graph metrics. Here we examine how these algorithm and parameter choices influence the reproducibility of proposed graph metrics on a publicly available test-retest dataset consisting of 21 healthy adults. The dice coefficient is used to examine topological similarity of constant density subgraphs both within and between subjects. Seven graph metrics are examined here: mean clustering coefficient, characteristic path length, largest connected component size, assortativity, global efficiency, local efficiency, and rich club coefficient. The reproducibility of these network summary measures is examined using the intraclass correlation coefficient (ICC). Graph curves are created by treating the graph metrics as functions of a parameter such as graph density. Functional data analysis techniques are used to examine differences in graph measures that result from the choice of fiber tracking algorithm. The graph metrics consistently showed good levels of reproducibility as measured with ICC, with the exception of some instability at low graph density levels. The global and local efficiency measures were the most robust to the choice of fiber tracking algorithm. J. T. Duda, P. A. Cook, and J. C. Gee, “Reproducibility of graph metrics of human brain structural networks.,” Front Neuroinform, vol. 8, p. 46, 2014. We contribute a novel multivariate strategy for computing the structure of functional networks in the brain from arterial spin labeling (ASL) MRI. Our method fuses and correlates multiple functional signals by employing an interpretable dimensionality reduction method, sparse canonical correlation analysis (SCCA). There are two key aspects of this contribution. First, we show how SCCA may be used to compute a multivariate correlation between different regions of interest (ROI). In contrast to averaging the signal over the ROI, this approach exploits the full information within the ROI. Second, we show how SCCA may simultaneously exploit both the ASL-BOLD and ASL-based cerebral blood flow (CBF) time series to produce network measurements. Our approach to fusing multiple time signals in network studies improves reproducibility over standard approaches while retaining the interpretability afforded by the classic ROI region-averaging methods. We show experimentally in test-retest data that our sparse CCA method extracts biologically plausible and stable functional network structures from ASL. We compare the ROI approach to the CCA approach while using CBF measurements alone. We then compare these results to the joint BOLD-CBF networks in a reproducibility study and in a study of functional network structure in traumatic brain injury (TBI). Our results show that the SCCA approach provides significantly more reproducible results compared to region-averaging, and in TBI the SCCA approach reveals connectivity differences not seen with the region averaging approach. For each metric, using both region averaging (orange) and SCCA (yellow), connectivity matrices were calculated from ASL data acquired in separate acquisitions in the same day and for data acquired one week apart. Whole network correlations were then calculated to examine reliability for the daily (left) and weekly (right) data for each subject. Here we illustrate results using sparsity values of s=t=0.05. A range of sparsity values (s=t) up to 0.25 were examined and these higher values did not produce qualitatively different results. J. T. Duda, J. A. Detre, J. Kim, J. Gee, and B. B. Avants, “Fusing functional signals by sparse canonical correlation analysis improves network reproducibility,” in Medical image computing and computer-assisted intervention–miccai 2013, Springer, 2013, pp. 635-642. Sample slices from the multivariate atlas used as a basis for neuro-anatomical comparison. Purpose: To evaluate the relationships between cerebral blood flow and other magnetic resonance (MR) imaging based measures such as fractional anisotropy, magnetic transfer ratio, cortical thickness and mean resting state BOLD signal in typically developing children. Methods: Eighty-eight children aged 7-17 underwent pseudo-continuous arterial spin-labeled perfusion MRI (pCASL)  examinations along with anatomical (T1), diffusion tensor (DTI), magnetic transfer (MT) and BOLD resting state functional MRI (rs-fMRI) examinations. For each imaging modality, the ANTs  toolkit was used to create a modality-specific template from a subset (n=30) of the subjects. For non-scalar modalities, derived scalar images were used for template building. 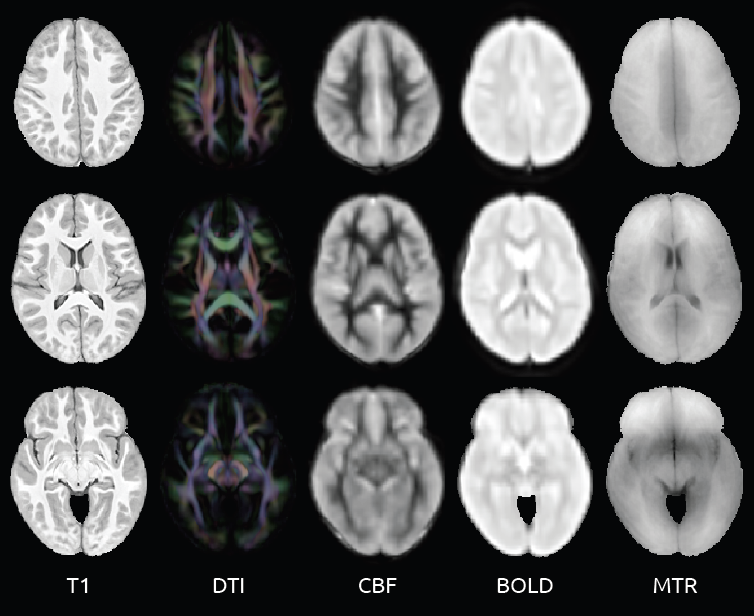 For pCASL the mean CBF image was used; for DTI the average diffusion weighted image was used; for rs-fMRI the mean BOLD image was used; and for MT the M0 image was used. Each modality-specific template was then registered to the T1 template to obtain a single multi-modality template (MMT). The T1 component of the MMT was then brain-masked, labeled, and three-tissue segmented using the Atropos segmentation tool . For each subject, each modality was aligned to the corresponding component of the MMT for brain-masking and labeling. Intra-subject registrations were then performed to align all modalities to each subject’s T1 image. To provide a basis for comparison, a scalar metric was derived for each image modality. For pCASL the mean CBF was calculated; for T1 images, the cortical thickness was measured using the DiRECT method; fractional anisotropy was calculated from the DTI; the magnetization transfer ratio (MTR) was calculated from the MT images; and mean BOLD signal was calculated from the resting state fMRI data. Results: Regularized canonical correlation analysis, as implemented in the sscan tool , was used to identify the relationship between CBF and each of the additional modalities. The analysis of each modality type is restricted to the most informative tissue type for that modality. For CBF, rs-fMRI and cortical thickness, only values in gray matter are examined, while only values in white matter are examined for FA and MTR. Discussion: To the best of our knowledge, this is the first study to simultaneously compare CBF to cortical thickness, fractional anisotropy, magnetization transfer ratio and mean resting BOLD signal in a single population. In doing so, we hope to gain insight regarding the degree to which CBF provides statistically unique information in relation to these additional MR imaging modalities. Additionally, the development of the framework for analyzing these modalities provides a basis for future studies to explore the relationship between CBF and network based measures of both structural and functional connectivity. Conclusion: The relationship between cortical thickness and Mean CBF (R2=0.4777) was the strongest of the metrics examined. In white matter, the MTR (R2=0.3126) was stronger than FA (R2=0.1462). The mean BOLD (R2=0.1414) metric was the weakest. Perfusion (top) and structural (bottom) templates calculated by using data from 22 subjects. Purpose: To evaluate the longitudinal repeatability and accuracy of cerebral blood flow (CBF) measurements by using pseudo-continuous arterial spin–labeled (pCASL) perfusion magnetic resonance (MR) imaging in typically developing children. Materials and Methods: Institutional review board approval with HIPAA compliance and informed consent were obtained. Twenty-two children aged 7–17 years underwent repeated pCASL examinations 2–4 weeks apart with a 3-T MR imager, along with in vivo blood T1 and arterial transit time measurements. Phase-contrast (PC) MR imaging was performed as the reference standard for global blood flow volume. Intraclass correlation coefficient (ICC) and within-subject coefficient of variation (wsCV) were used to evaluate accuracy and repeatability. Results: The accuracy of pCASL against the reference standard of PC MR imaging increased on incorporating subjectwise in vivo blood T1 measurement (ICC: 0.32 vs 0.58). The ICC further increased to 0.65 by using a population-based model of blood T1. Additionally, CBF measurements with use of pCASL demonstrated a moderate to good level of longitudinal repeatability in whole brain (ICC = 0.61, wsCV = 15%), in gray matter (ICC = 0.65, wsCV = 14%), and across 16 brain regions (mean ICC = 0.55, wsCV = 17%). The mean arterial transit time was 1538 msec ± 123 (standard deviation) in the pediatric cohort studied, which showed an increasing trend with age (P = .043). Conclusion: Incorporating developmental changes in blood T1 is important for improving the accuracy of pCASL CBF measurements in children and adolescents; the noninvasive nature, accuracy, and longitudinal repeatability should facilitate the use of pCASL perfusion MR imaging in neurodevelopmental studies. Varsha Jain, BS, Jeffrey Duda, PhD, Brian Avants, PhD, Mariel Giannetta, BS, Sharon X. Xie, PhD, Timothy Roberts, PhD, John A. Detre, MD, Hallam Hurt, MD, Felix W. Wehrli, PhD and Danny J. J. Wang, PhD, MSCE. “Longitudinal Reproducibility and Accuracy of Pseudo-Continuous Arterial Spin–labeled Perfusion MR Imaging in Typically Developing Children,” Radiology 2010; 263:527-536. In this paper functional subnetworks in the brain were examined using MRI to measure both structural connectivity and functional connectivity. Additionally, the influence on behavior of both types of connectivity examined to determine the degree to which each provides unique information as well as how this information may be used to identify the parts of a network that are most influential on behavioral performance. Functional connectivity involves co-activation of brain regions during performance of a task while brain recruitment is monitored with fMRI. Structural connectivity is related to the long tract white matter projections that may integrate recruited brain regions biologically. Here we demonstrate how structural and functional connectivity may be used to examine small, functionally defined subnetworks in the brain during performance of a common language task. Functionally defined cortical regions are used along with a population-averaged diffusion tensor atlas to identify the white matter pathways that provide the basis for biological connectivity. A centerline-based method is used to provide a geometric model that facilitates the equidimensional comparison of functional and structural connectivity within a network. Behavioral data are used to identify the relative contributions of function and structure, and the degree to which each provides unique insight into behavior. Duda, Jeffrey T., “Characterizing Connectivity In Brain Networks Using Magnetic Resonance Imaging” (2010). Publicly accessible Penn Dissertations. Paper 191. 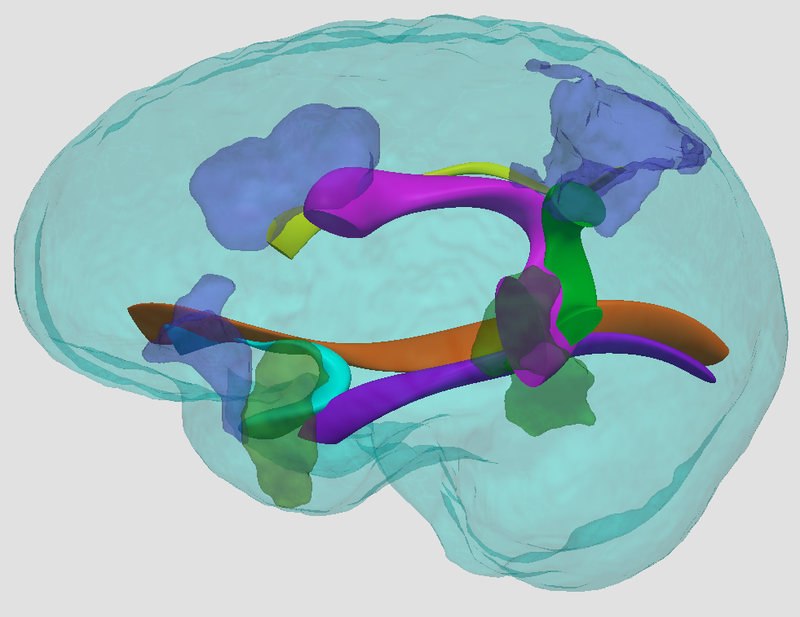 In each hemisphere of the brain, the thalamus and three cortical subregions in the prefrontal cortex were identified and used along with diffusion tensor based fiber tractography to model the white matter fiber bundles that connect the thalamus to each cortical region. Traumatic brain injury (TBI) is one of the most common causes of long-term disability. Each year, approximately 1.5 million people sustain TBI in the United States alone, causing billions of dollars of economic cost. Among the survivors, many individuals are left with significant long-term cognitive and motor disabilities. However, efforts to identify the neuropathologic correlates of these deficits have gained only limited success to date. The use of more sensitive and reliable in vivo neuroimaging protocols may facilitate the identification of specific brain-behavior relationships in the TBI population. Here we present a study that explores novel methodologies for examining neuroimaging data to gain further insight into TBI. Two different types of Magnetic Resonance Images (MRI) are used: diffusion tensor (DT) images quantify connectivity patterns in the brain while the T1 modality provides high-resolution images of tissue interfaces. Our objective is to use both modalities to build subject-specific, quantitative models of fiber connections in order to discover effects specific to a neural system. We first use a population-specific average T1 and DT template to label the thalamus and cortical regions of interest. We then build an expected connection model (illustrated above) within this template space that is transferred to subject space in order to provide a prior restriction on probabilistic tracking performed in subject space. This allows for the comparison of properties such as fractional anisotropy (FA) within a common framework along fiber pathways. Students t-test results after FDR correction at p<0.02 indicate that the left hemisphere connection between thalamus and Brodmann area 10 is affected by TBI. Arrows indicate regions where TBI survivors show reduced FA compared to controls. A sagittal slice from the T1 component of the template is shown for anatomical reference. J. T. Duda, B. B. Avants, J. Kim, H. Zhang, S. Patel, J. Whyte, and J. C. Gee, “Multivariate Analysis of Thalamo-Cortical Connectivity Loss in TBI,” in Proc. Computer Vision and Pattern Recognition, Ninth IEEE Computer Society Workshop on Mathematical Methods in Biomedical Image Analysis (MMBIA), Anchorage, AK, 2008.